Review: London Film and Comic Con. There aren’t many places in the world where you can walk into a room and see Batman and Jon Snow from Game of Thrones having a casual chat whilst a couple of Orcs and a Wookie wander past, but such sights became the norm when I attended Winter Film and Comic Con in London earlier this month, as thousands of sci fi and comic fans turned up to celebrate their passions. It’s interesting to think that the first Comic Con, which was held in a hotel dining room in San Diego in 1971, attracted only 300 people. Now, fans travel from all over the world to the annual San Diego event in their hundreds and thousands, attracting stars from some of the biggest films and TV shows in the world. London can’t quite match this level, but never the less there’s a large turn out, and a staggering amount of enthusiasm. Standing in the line outside of Olympia Grand Hall, you can’t help but feel swept up by the atmosphere. Many people are dressed up, from small, homemade zombie costumes to full Weeping Angel ensembles that must take hours to prepare for. And inside, artists and merch stall owners fill the majority of the room, selling everything from comic books, to dolls, to autographs to custom sketches; everything a super fan could possibly desire. And along the edges of the building are the special guests. There’s a real joy in spotting people from film and TV shows in real life, signing autographs and chatting to eager fans, or disappearing into booths where photographs with the stars can be bought and taken home as mementos. I can’t even explain the kick I got of from hearing the booming voice of actual Brian Blessed across the room. But the fans who attend the event are just as interesting and entertaining as the guests. The amount of cosplayers is staggering, and there’s everything to see; from barely clothed Princess Leia’s to toddlers dressed in their finest “Winter is Coming” cloaks. Even those who aren’t dressed up are fully into the spirit, clutching merchandise they hope to get signed by stars of their favourite shows. There’s a certain mocking and stigma that comes with events like this; that they’re little more than a nerd paradise, catering only to those who are fans of a niche part of pop culture; a haven for Trekkies and sci-fi fans, but offering little for those who are perhaps less passionate about the TV and comic industry. I’m a self confessed geek (so I love conventions anyway) but this perception does appear to be changing, as stars from successful mainstream shows like The Walking Dead, Doctor Who and Game of Thrones provide some of the biggest draws. Current stars like Doctor Who’s Billie Piper and The Walking Dead’s Jonny Bernthal draw perhaps the biggest crowds, but there’s also plenty of room for nostalgia, as cult stars from the past including Margot Kidder of Superman fame, and Flash Gordon himself Sam Jones also make appearances. There were even two of the original Power Rangers in attendance. My inner eight year old had never felt so elated. There’s just a really nice, warm atmosphere to be soaked up throughout the whole event. You can be yourself, or you can play at being someone completely different to yourself, and no one at all will judge you. In fact they’ll appreciate you. I almost felt like an outsider for not being in costume. And when a family of Doctor Who cosplayers wander past (complete with Tom Baker style toddler) or a group of Ghostbusters whizz by, or a man in the most terrifying Hell Raiser costume known to man creeps up behind you, it’s hard not to get caught up in the enthusiasm. Everything just feel so much fun. 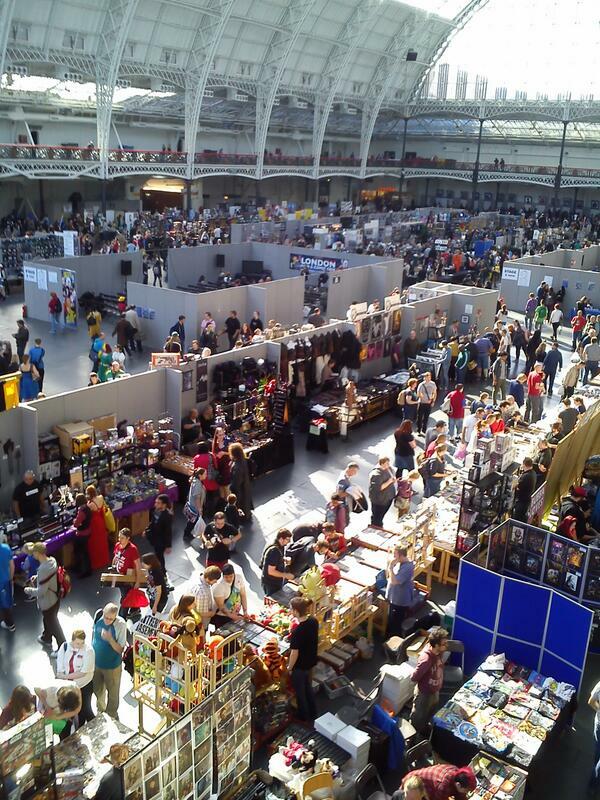 So conventions may not be the most conventional of events, but with previous London Cons drawing over 80,000 fans, it’s difficult to argue with their increasing popularity. Are they weird? yes, perhaps a little. But in the best possible way.